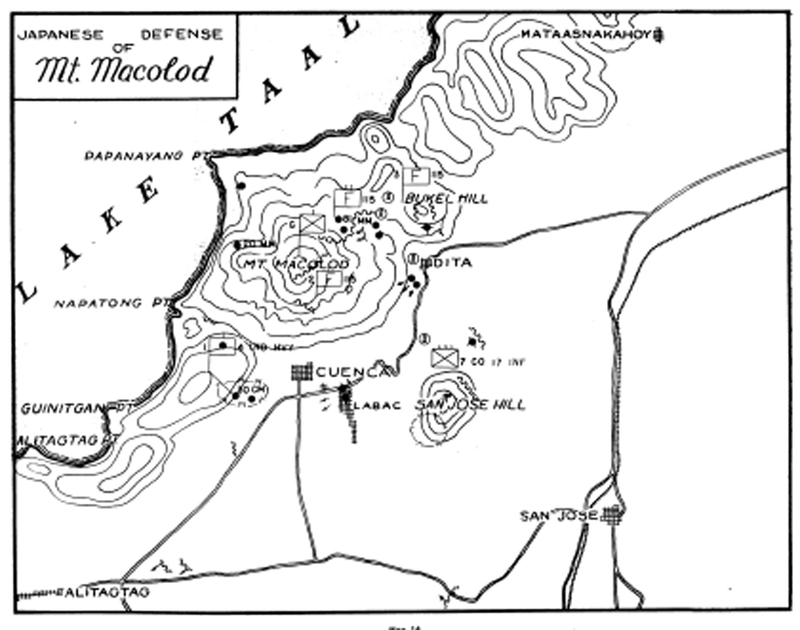 Map of Japanese defenses at Mount Maculot in 1945. The map above shows Japanese defensive positions at Mount Maculot (Macolod as reflected in the map itself; this was how many American documents of the era referred to the mountain) in 1945. The battle that was fought at the mountain in March and April is considered by many military historian as among the fiercest in the Western Pacific Theater of War. Forces of the Japanese Imperial Army under the command of then-Colonel Masatoshi Fujishige dug themselves well in the mountain. Their positions are shown in the map as black circles, with the types of guns at their disposal also indicated. The map is taken from a public domain book entitled “The Angels: A History of the 11th Airborne Division 1943-1946,” written by Major Edward M. Flanagan Jr. and published in the United States in 1948. The book itself is about the exploits of the 11th Airborne in Batangas, one of the leading arms of the United States Army in the liberation of the province. A subsection of this web site is devoted to articles based on Flanagan’s book: Batangas in World War II 1942-1945.